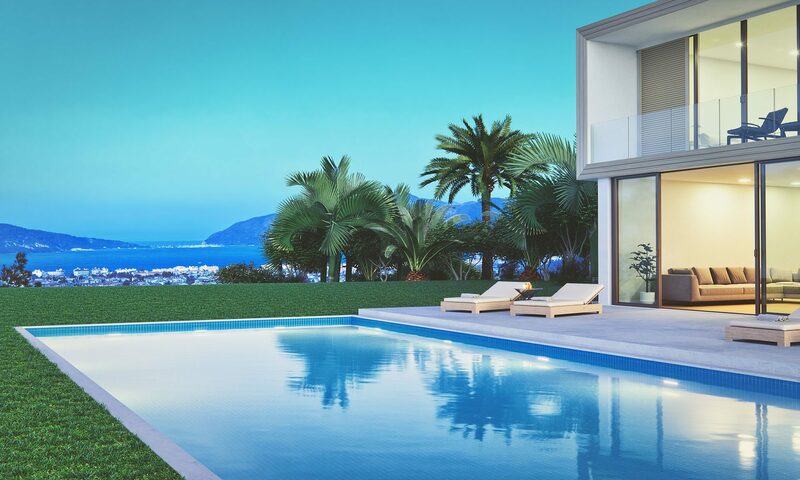 With Christmas just a week away, we know there is one thing on your mind! Holiday Cocktails!! Just as true as the spirit of Christmas, the “Spirits” of Christmas are your key to surviving Manic Monday with your in-laws. 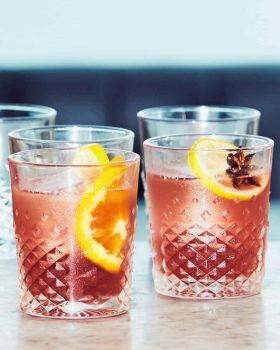 So check Cranberry Spritz off your list because have rounded up the best seasonal beverages to put you in a holly jolly mood. Bring sugar, 1 1/2 cups water, and juniper berries to a simmer in a pot, stirring until sugar is dissolved. Remove from heat; let cool completely. Strain through a fine-mesh sieve; discard solids. Refrigerate 1 hour or up to 1 week. For each cocktail, combine 3 tablespoons juniper syrup with 1/2 cup sparkling wine in a glass. 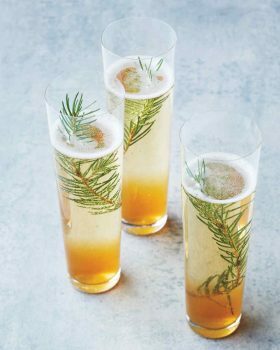 Garnish with a pine sprig; serve immediately. 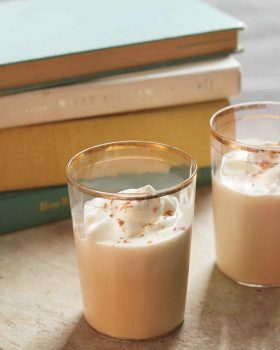 There’s no substitute for homemade eggnog during the holidays! Our latest, greatest version combines silky custard with three types of booze — bourbon, rum, and cognac. Freshly grated nutmeg offers a more delicate flavor and aromatic scent than the pre-ground variety. The eggs in both the base and the meringue are cooked, so food safety shouldn’t be a concern. Pour yolk mixture back into saucepan. Cook over medium heat, stirring constantly with a wooden spoon, until mixture is just thick enough to coat back of spoon and hold a line drawn by your finger, 3 to 5 minutes. Whisk remaining 1/4 cup sugar and egg whites in a heatproof mixer bowl set over (not in) a pan of simmering water. Whisk until sugar is dissolved and mixture is warm (it should feel smooth between your fingers), 2 to 3 minutes. (For fully cooked eggs, a thermometer inserted into meringue should register 160 degrees.) Remove from heat. With a mixer on high speed, beat until stiff peaks form, about 5 minutes. Fold into eggnog. Cranberry simple syrup gives this frozen cocktail a festive crimson hue — perfect for the holidays! Make the Whole-Berry Cranberry Simple Syrup: Stir together sugar, cranberries, lime zest and 2 tablespoons water in a small saucepan. Cook over medium-high, stirring constantly, until cranberries just start to burst, about 5 minutes. Remove from heat; let cool completely. Refrigerate, covered, until cold, at least 1 hour and up to 1 week. 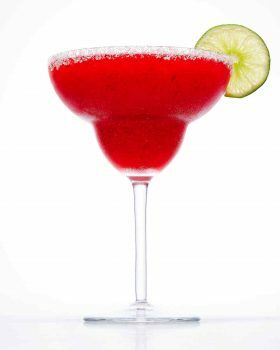 Make the cocktail: In a blender, combine tequila, lime juice, 4 cups ice, and 1 1/2 cups cranberries and syrup from Whole Berry Cranberry Simple Syrup. Blend until smooth. Divide among 4 margarita glasses. Sherry, Bordeaux, Champagne, rum, and black tea meld with fruit in this knockout punch recipe that’s adapted from “The Steward & Barkeeper’s Manual” (1869). It can easily be doubled to serve a larger crowd. Bring 4 cups water to a boil. Remove from heat and add tea bags; let steep 10 minutes. Remove tea bags. Add oleo saccharum, stirring until sugar dissolves and mixture is translucent. Remove lemon peels with a slotted spoon; discard. Stir in lemon juice, rum, sherry, and wine. Refrigerate until cold, at least 1 hour and up to 1 day. When ready to serve, line the inside of a large punch bowl with pineapple slices (do not overlap). Fill one-third of the way with large ice cubes. Slowly pour tea mixture into punch bowl, making sure not to disrupt pineapple slices. Top with Champagne; gently stir to incorporate. Float lemon and orange slices on surface; sprinkle with star anise and nutmeg. Serve over ice. Fresh rosemary adds a lovely woodsy aroma to this fruity, bubbly Pinot Noir-based cocktail. Fill four glasses with ice; add 1/3 cup Pinot Noir and 1/3 cup ginger ale to each glass. 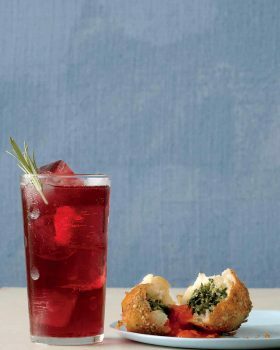 Add 1 1/2 teaspoons cherry-flavored liqueur to each glass. Stir to combine and serve with rosemary sprigs, if desired. 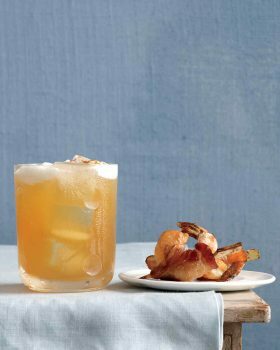 A pinch of cayenne pepper turns up the volume on this refreshing cocktail made of bourbon, lemon juice, maple syrup, and apple cider. Fill four glasses and a cocktail shaker with ice. To shaker, add bourbon, lemon juice, maple syrup, and apple cider; shake vigorously. Strain into glasses and top each with a pinch of cayenne pepper, if desired. Can’t decide between a post-dinner drink and a hit of caffeine with something sweet? 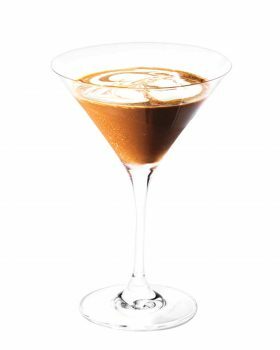 This mocha cocktail should satisfy both cravings. Combine chocolate and sugar in a cocktail shaker. Pour espresso shot over chocolate mixture; stir until smooth. Add vodka and a few ice cubes. Shake vigorously several times, then strain into a chilled martini glass. Spoon over top a few tablespoons of heavy cream that’s been whipped just until silky and thick; stir with a toothpick to create streaks. Serve immediately. 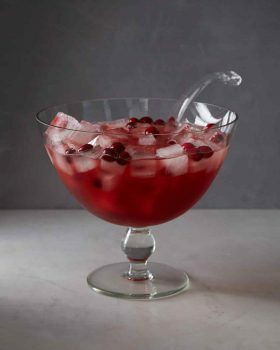 Float cranberry ice cubes for a more festive punch bowl — drop 1 or 2 cranberries into each ice cube mold before filling with water and freezing. This recipe comes from Sas Stewart of Stonecutter Spirits. Stir together gin, pomegranate juice and simple syrup in a punch bowl or large pitcher. Add ice cubes and sparkling rose just before serving. For a cranberry-infused simple syrup, add 2 cups fresh or thawed frozen cranberries to saucepan with water and sugar before cooking. Strain the syrup once cool, and discard or reserve the cranberries for another use. 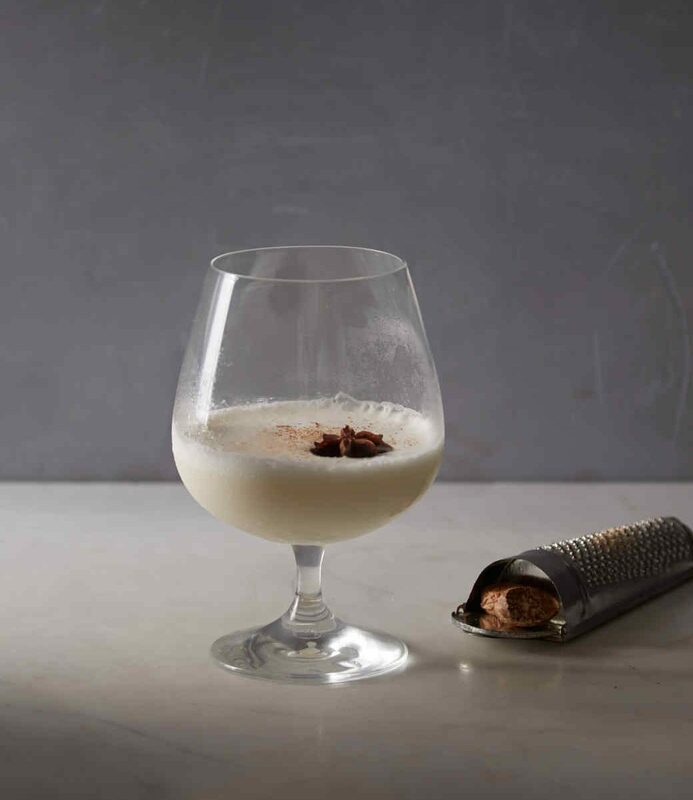 Spices add a complementary note to most cream-based cocktails — grated nutmeg and aromatic star anise add flavorful dimension while also providing a visual accent in this recipe from Sas Stewart of Stonecutter Spirits. Shake together gin, cream, creme de cacao, and bitters vigorously with ice in a cocktail shaker for 8 to 12 seconds. 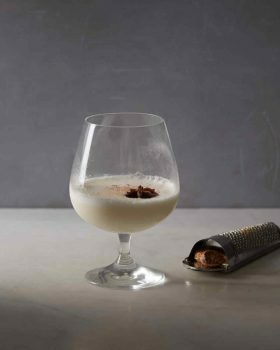 Strain into a chilled brandy snifter glass. Sprinkle with nutmeg and float star anise.